I was a dutiful Scout rather than an enthusiastic one. 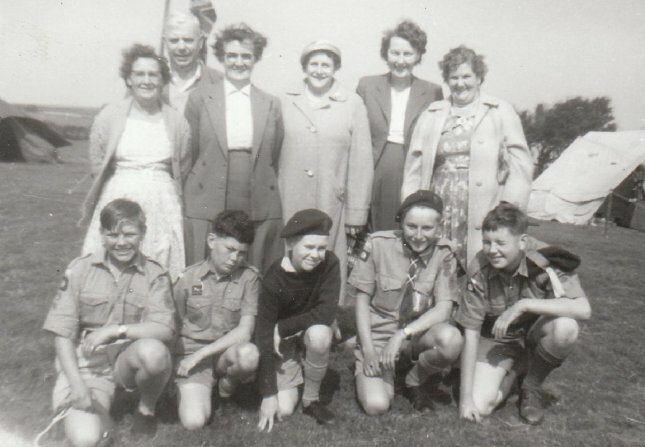 I toed the line, because to do so was a family tradition, but I never felt an affinity with the uniform or the ceremonial, and if monthly church parades had been compulsory I would not have joined. Weekly meetings in the Scout Hut did little for me, and I often tried to devise excuses to miss them, though Mum pressed me to keep up my attendance. Just two things drew me to Scouts: wide games on the wilds of the Chevin, and camping. My first camp at Ilkley when I was eleven was a Saturday night event, and I think it was held in September. The District had invited all Troops to camp by the river. The purpose of the camp was never clear to me: maybe the District Commissioner (Colonel Maufe, known as ‘Gunner’ within the Scouts because - I’ve always assumed - he served in the Royal Artillery) wanted to bring together all the Troops in Wharfedale during his watch. Maybe, as a military man, Gunner understood the word ‘Troops’ differently from us. Our leaders said it would be a good introduction to sleeping out, so off I went with my new sleeping bag and groundsheet, plastic bowl, plate and mug, and a knife, fork and spoon. I remember little about the camp, except that we bedded down in a ridge tent and endured an uncomfortable night. I don’t recall what we did, what we ate, whether we had a campfire, or how we got there and back. I do retain a sense that the event was highly structured, but I have no recollection of any sort of fun. 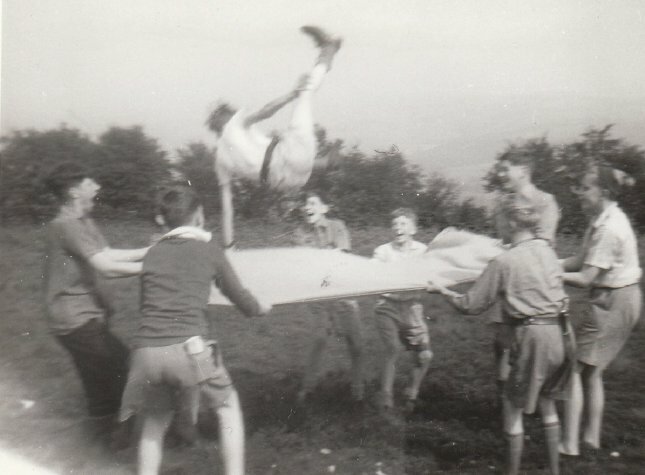 I missed the outdoor sleeping at the 2nd Otley’s regular camp at Whitsuntide 1958 because I was recuperating from my appendectomy. I visited most days, walking up East Chevin Road with Dad and our dog Rex, to where the lads had set up camp on Shaw Field. There was a marquee where the leaders slept and kept the stores. The Scouts slept in bell tents, though I gather there wasn’t much sleeping as Cappo struggled to impose order, particularly on the wayward and cheeky Guzzy. Shaw Field was a wonderful campsite in the late nineteen-fifties and early nineteen-sixties, though in 2007 it is no longer used as such and is much more heavily wooded. It was part of the land given to the town in perpetuity for recreational purposes by George Horton Fawkes in 1946. The location was superb for wide games, with unfettered access to hundreds of acres of rough ground. We had ample space for our tents on a gently sloping expanse of tough upland grass, with patches of heather and scattered silver birch trees. To the west was a shelter belt of sycamores; to the north the land fell steeply into Wharfedale, and silver birches, boulders and bracken clothed the hill; on the other sides were young conifers planted by the Otley Urban District Council’s foresters, beginning the long process of replacing trees cut down in the Second World War. Firewood was easily found, and the crumbling walls from the enclosures of the eighteenth century provided hearthstones for our wood fires. We drew water from a catchpit on East Chevin Road and lugged the heavy containers through the trees to our kitchen. The camp lasted four days, which was the duration of the Whitsuntide half-term break. Traditionally on the day before we broke camp the leaders served prunes and custard for dessert, ensuring no one went home with more food inside them than they’d brought to camp. On the final afternoon, someone had to dig a pit in the woods and empty the Elsan. This was the chance for the leaders to take their revenge on the cheekiest boy. Cappo would have chosen Guzzy, but, for his incessant baiting of the Wardmans, the ‘honour’ was awarded to Robert. Other Troops sometimes set up nearby, and in 1959 we combined with the Salem Scouts for a wide game and a campfire, which soon led to greater things. The Salem Troop was based at the Congregational church on Bridge Street, though few of the lads had any particular loyalty to the church before they joined. None of them had attended my junior school, and most lived north of the river or on the west side of town, so they were new to me, apart from Alec Marsden who was a colleague in Form 1X at Prince Henry’s Grammar School. The Salem lads were not much different from us, but they had a very different bunch of leaders. 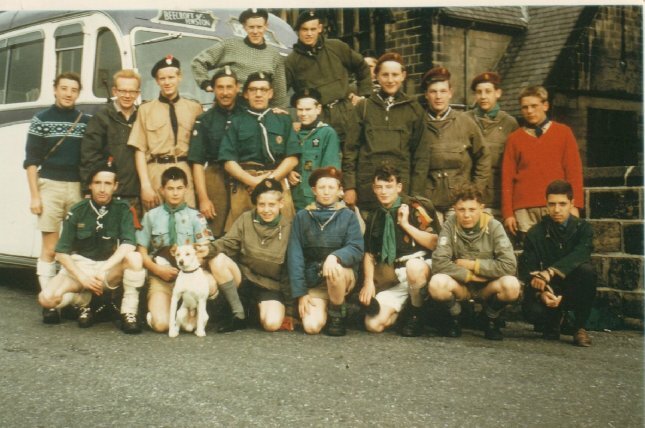 Their Scoutmaster was Geoff Lister, known as Skip, a swarthy man with a moustache and tobacco stained teeth which he readily flashed in a tolerant smile. Supporting him was a bewildering array of assistant leaders and Senior Scouts. One afternoon at the Whitsuntide 1959 camp they organised a wide game that involved us navigating to three or four different locations and finding clues on triangulation pillars or signposts. I was in a team led by Peter Wardman, David’s younger brother. He was four years older than me, and Mum always held him up as an example of how I should behave. Our team made it all the way round, reaching the end point about half a mile from camp, where the Senior Scouts declared the game complete. I added my ‘Yes!’ to the collective response, and with a whoop the Seniors set off. I never knew anyone could run so fast! I started with them, but their length of leg meant I had to sprint to keep up. I soon slowed down, but it didn’t matter because we could all see our way back to camp, and everyone rolled in at their own pace. 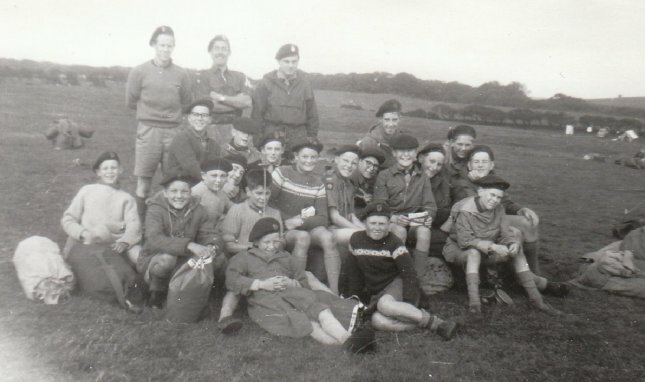 A few weeks later we heard there would be a joint camp of one week’s duration with the Salem Scouts that August at Grange over Sands on the edge of Morecambe Bay. David and Peter Wardman would be going, and Robert, Michael and I decided we’d like to go too. One Saturday towards the end of August we assembled outside the Congregational schoolroom and watched the big chaps load the camping and cooking gear onto an open lorry. When all was done we were told to climb aboard. Seated on top of tents, lumber, cooking pots, stores, tools, ropes and goodness knows what other necessities, we rumbled away to join the A65, heading northwest. It now seems amazing that we travelled thus, exposed to the weather and highway hazards. We safely reached the Three Peaks café at Ingleton and dismounted to start spending our money on chocolate. Some of the leaders and Seniors lit up cigarettes, and one of them, Don Marston, fed the jukebox and selected ‘Living Doll’. I’d never seen a jukebox before. Eventually we trundled up to a sheltered clearing in the woods above Grange over Sands, and Skip instructed us where to pitch our tents. At twelve years old we had escaped from home, travelled into a different county, seen a coastline we’d never seen before, and it was only mid afternoon. We were all assigned cooking and washing-up duties under the supervision of a Senior Scout. On the Sunday our mothers came by coach to see where we had gone and to deliver things we’d forgotten. Apart from that we had a lot of free time, and Michael and I spent much of it travelling by train round the bay to Morecambe, with its unparalleled opportunities to buy sweets and enjoy all the other delights of a seaside resort. We dutifully sent postcards and bought presents for our families. On the following Saturday we broke camp and travelled back, eating sandwiches on the back of the lorry as it ground its way slowly east, holding up a line of cars. John Parker, sitting at the rear, waved at the queuing motorists, pulled faces in an amiable fashion, and threw them the occasional sandwich as a peace offering. Several years later, John became a minister in the Congregational church, now known as the United Reform Church: perhaps even in 1959 the concept of distributing loaves and fishes was closer to his soul than those motorists realised, as they stopped to wipe smears of margarine and fish paste from their windscreens. I learned in 2007 that Dad wrote a letter from him and Mum, thanking Skip Lister for giving us lads such an enjoyable holiday. Quite right too! In the few weeks between Whitsuntide and the end of August I’d discovered that camping could be real fun. For the following three years we spent Whitsuntide camping on the Chevin and joined the Salem boys for their summer camp. In 1960, our lorry took us to an exposed cliff-top site above Sandsend near Whitby. The next year we rode by train to a wet and midge-ridden field at Roewen south of Conway in North Wales, and in 1962 we returned to Grange over Sands, this time in Beecroft’s bus. But before all those events took place, we had another game to play.